Greetings, may I request a service number please? Hopefully this is submitted correctly. Just a query if I may? Is it possible to suggest a service number if it is not being used already? Promotion is for the outstanding execution of his duties throughout the year and especially in regards to providing invaluable support during a recent combat drop in aid of a local charity. Last edited by septic on Sun Nov 12, 2017 1:17 am, edited 1 time in total. 38 year old brigadier general smartgunner? Are you kidding me? (b) Brigadier General <-- how about PFT as an homage to Full Metal Panic? Any rank would do as long as you can figure out a way to make it funny. It is cosplay, laughs are required. I will request e status upgrade once I finish the smart gunner build. for now my predator costume will have to suffice. (b) Colonial Marine Rank Seargeant <-- could be Major and I could call her my major pain if you get that movie reference. Was shooting for a vasquez type build, but I ran out of time and money to finish our the smart gunner build out. Will order proper uniform next year. Use your best judgement. I will be leading some things here in Knoxville and am trying to push for getting a USS Andrew Jackson based out of K-town going as there are a lot of locals interested here in Knoxville. 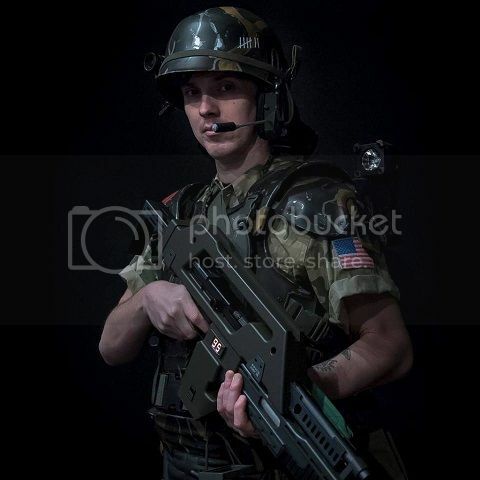 Requesting a rank promotion for John Stevens A10/TQ1.0.22132E1 [AL handle: TUSKY] from the current Private First Class to the rank of Private. I hate to sound like a downer, but that's a demotion. Would you consider making him a corporal instead? Thanks SGM Baldwin, you are the best! First in...last out. Never leave a marine behind. Apologies. Yes, promotion required. Original request corrected. Good afternoon Sarge, I'm another fresh recruit requesting a Service number. Good evening Sergeant, I am a new recruit to the GERCM and hereby requesting my Service Number. Always remember: Beware the Heartbreaker! Adding my first drop date too. For the CMD, my first drop was in Atlanta, 2009. No idea what the date was. My mommy always said there were no monsters, no real ones... but there are. Dang, How have i been a member here for so long and not known about this? It was just brought to my attention by another member. I joined in 2008 and again in 2012 when I couldn't find my 2008 account. I never even know about this registry. (b) (REC?) I don't really know how this works. Would it be possible to get allocated a service number please.